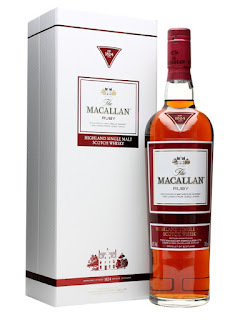 Continuing with the over-hyped sherried malt theme, today we've got some Macallan from the archives. Instead of having another rant today, let's just get to the reviews. Nose: Sweet sherry, fresh fruit- Apple, vanilla, bit of toffee, coffee, malt note, caramel. After some time- More coffee and some chocolate, sticky toffee pudding. Taste: Fresh fruit- Apple, bit of pear, light sherry, bit of chocolate, toffee, coffee, malty note. Finish: Medium length. Drying with oak and coffee. Nose: Big, very sweet. Rich exotic spices (cinnamon and saffron) and fruit. 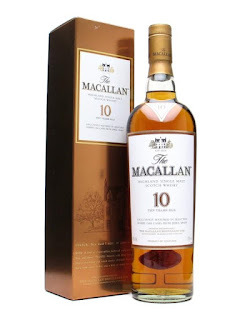 Vanilla, thick sweet honey, lots of brown sugar, complex dried fruit- Raisin, dates, fig, red grape, plum, Christmas cake, all soaked in sweet old brandy and rum, old herb cupboard, tonnes of sweet sherry. 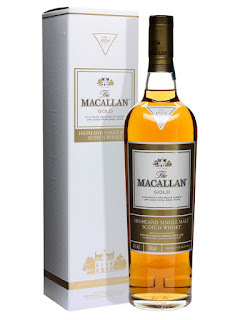 Taste: Creamy arrival, staying creamy with lots of complex fruit- Raisin, fig, apple, pear, dates, spice, complex oak, coffee, drying oak, Oloroso sherry, spice and herb cupboard, leather, wood polish, menthol, pipe tobacco, molasses. Finish: Long length. Coffee, oaky tannins with lasting fruity chocolate. Notes: 1st time I had this it blew me and the Balvenie 21 Portwood away. 2nd time it was less good, average of the 2 scores. Nose: Fruit, vanilla, sherry notes, almond, marzipan, creamy cream, toffee. Apple pie, malty chocolate, twiggy toffee, sweet red apple, bit of cinnamon. Taste: Sweet, then nothing for a bit, a bit watery, apple?, pear, bit of spice- Cinnamon, a little cream. Not much body. Finish: Short/Medium length. Vanilla, sweet then a bit more spice. Dark chocolate and coffee after a bit. Nose: Fat, Sherried, rich fruit, raisin, lots of fig, blood orange, vanilla, pastry, chocolate cake. Water: A small drop reveals an earthiness, wet leaves, Autumn, forest floor, red apple, cinnamon and other baking spices. Taste: Soft arrival, tannins, oak, then a wave of rich dried fruit, raisin, fig, prune, oak still present, sticky PX sherry, raisin juice. Water: Thinner but actually more nuances, small pockets of fresher fruit, red apple, some baking spices with cinnamon. Finish: Medium length. Quite thin, oak and tannins. Nose: Sherry and apple, lovely fruity combo. Raisin, mango, malt, sweet honey, a floral note- Wild heather, quite old school with oily barley, fruit tea, spicy apple tea, cinnamon and ginger. Lovely balance. Water: As with the Ruby- More reminiscent of Autumn. Forest floor, wet trodden leaves, barley sugar, crystallised honey, golden raisins. Taste: Sweet arrival with barley sugar, then sweeter fruit, red and green apples, sour lemon citrus, malty, nutty dry oak, quite oily, honey and beeswax, building spicy ginger and white pepper, a small spirity note- vodka, some light bitterness coming out with some dark chocolate and liquorice, then toffee into the finish. Water: Soft, building up with orchard fruit, red apple, golden raisins, soft spice, lovely fresh orange then some oak goes into the finish but not as bitter as before. Finish: Medium length. Warming with bright toffee and a little dry oak. 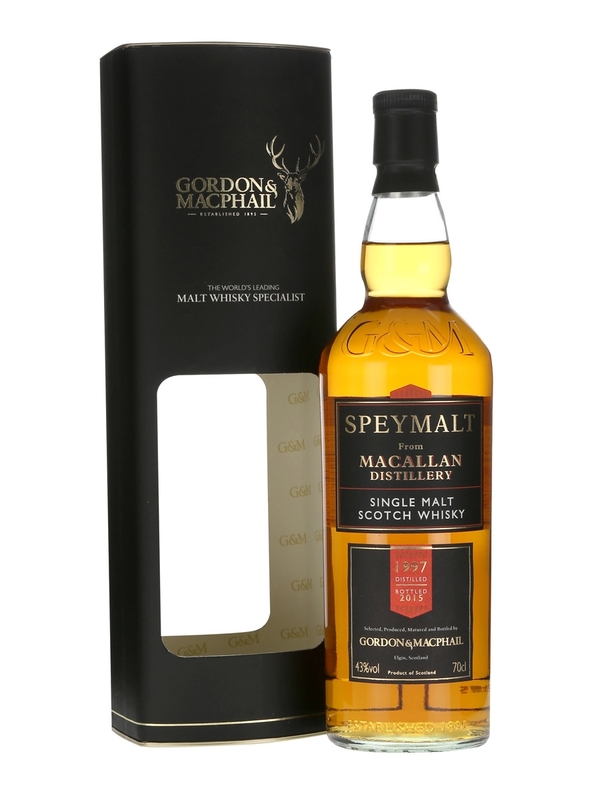 Notes: Bottled 2015 at 18 years from Gordon & MacPhail. 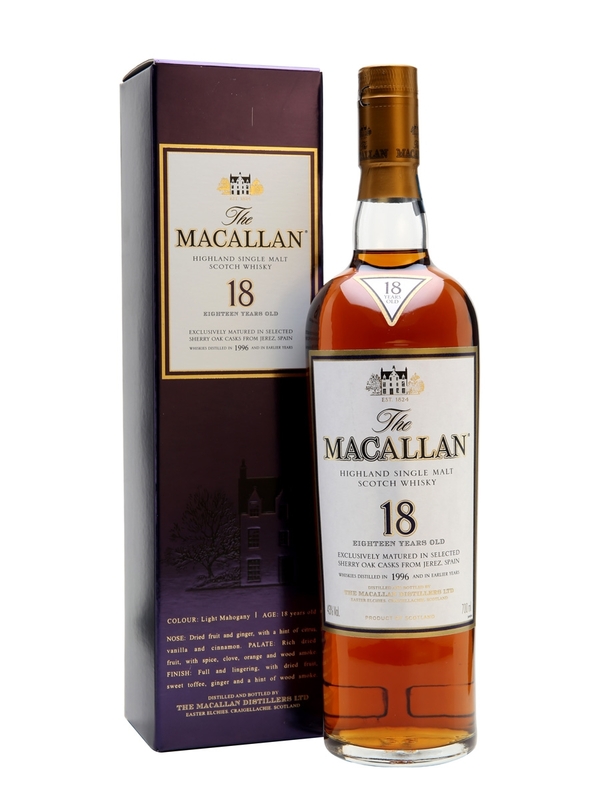 One of the few indie bottlers of Macallan, maybe the only regular. From Sherry and Bourbon barrels I believe. Nose is a stunner but the taste is a little worse and the finish is a little worse again.